On February 15, 1936, Roddy Burdine, Miami’s Merchant Prince and Chairman of Burdines Department Store, died at St. Francis Hospital on Miami Beach of encephalitis. He was only 49 years old. Burdine’s illness was said to have been from drinking non-pasteurized milk. Burdine was an icon in the Miami business community and the news of his death hit the entire city very hard. Shortly after his death, the Miami City Commission voted to rename a new football facility, the future Orange Bowl, “Roddy Burdine Memorial Stadium”. The stadium was built by the Public Works Administration in 1937 on an area that once hosted Tatum Field. The adoption of the name of the stadium took place in a ceremony on December 10th, 1937. 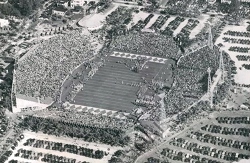 However, beginning in the early 1950s, the name of “Orange Bowl” became the accepted name of the stadium until it closed in January of 2008. To Read More about Roddy Burdine and the Burdine Family, check out “Burdines: Roddey Burdine, His Family and Their Namesake Store”, by Paul S. George.